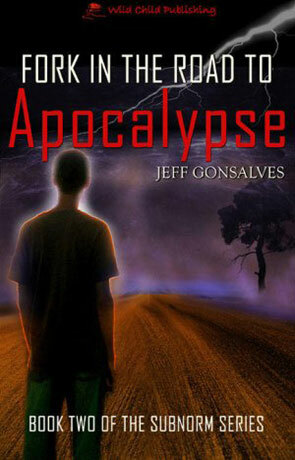 Fork in the Road to Apocalypse is the second volume in the Subnorms, written by Jeff Gonsalves. It's the middle of the 21st Century and much of the World's population have seen their genetic makeup mutated by insidious viruses and powerful radiation. A sub species of human has developed from these genetic abberations - known as "Subnorms", many of whom have developed special abilities including mind control, telepathy and even the very manipulation of reality. Elliott Anderson is one such "Subnorm", hidden from the authorities by his mother until a desperate Elliott transforms his home into a fiery vision from Hell. The resulting attention from the government lead to Elliott being detained in a maximum-security seclusion tank. Can his uncle save Elliott from those that seek to control his talents, more importantly can he save Elliott from himself? I must admit that I was completely unprepared for this novel, it's got a very mature, graphic and descriptive voice that is both distinct and very individual. The novel wastes no time and jumps straight with an action packed, fast paced plot that doesn't let up for the entire journey. The book doesn't hold back with scenes of violence and there is a real edge to these displays that make them quite powerful, very well described with a fairly dark and subtle humour just visible under the surface. Some of the scenes are priceless, like the attack of the plant man right at the beginning and the interrogation scene with Jerry Grouse. There is little time given to back story and for the most part it is very well written. I did find that on the odd occasion the narrative seemed to exist purely to inform the reader and that did jar a little but overall the quality is excellent and I really couldn't put the book down. The story itself focuses on those who have been changed due to contact with the "Klepto virus" (along with high levels of Radiation) which is rumoured to to enhance the unused areas of the brain. Many of these "subnorms" also have physical mutations that vary from extra limbs to exoskeletons and many other more horrific variations. At it's heart this novel (and I presume the series) is about how we as humans treat (or more often don't) people who are different - evident in the very name "subnorm" that infers that these people are somehow less than human. Much of the story is given over to exporing how that discrimination effects the victims and also even family themselves react. The technological aspects are very much underplayed and the story exerts all the power for that reason, there is no hiding behind modern conveniences or technobable here. Fork in the Road to Apocalypse is a fast, brutal and darkly rewarding tale, well executed with an almost movie like quality. Written on 23rd March 2011 by Ant.